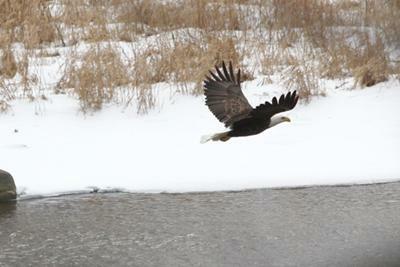 2 pm Feb 19 2012, Two Bald Eagles were on the Maitland River just back of my house. I got photos of one on a stump in the river. The second one was on the snow covered ground 50 ft away and joined number one for 20 seconds before they both flew off in opposite directions. This my first sighting ever. I used to go to High School in Wingham and now am in Windsor. We have a lot of Bald Eagles nesting in the Windsor and Essex County Area. To have a pair in the Wingham area should mean that there are many more. They are truly a majestic bird to observe and in flight. 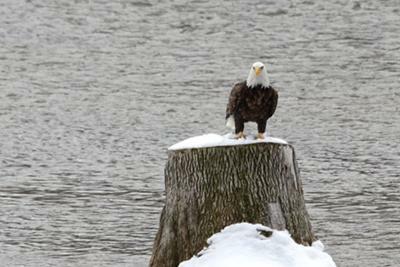 March 7th 2012 - I have had 9 Bald Eagle sightings at Wingham, Ontario, in the last 15 days! Great shot Alex. Doesn't it give you a thrill?